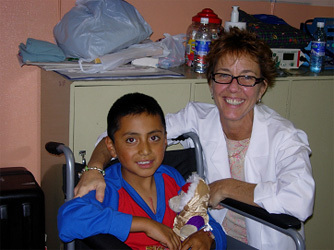 A hallmark of Por Cristo’s work, from its earliest days, has been sending medical teams to Ecuador to work with local counterparts to provide critically needed specialty care. 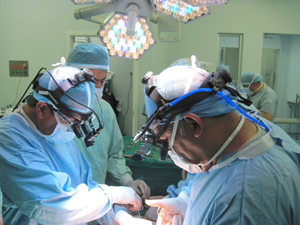 Team expertise has included maxillofacial surgery, burn care, orthopedics and pediatric cardiology. As Por Cristo scaled up its year-round community health clinic in the late 1990s with local staff, we reduced the number of visiting teams. One team we chose to continue to fund on a regular basis was the Pediatric Cardiac Team. Annually, a team of pediatric cardiac surgeons, cardiologists, nurses and other medical professionals travel on a one to two-week mission to work with their Ecuadorian colleagues in a mutual exchange of healthcare knowledge. 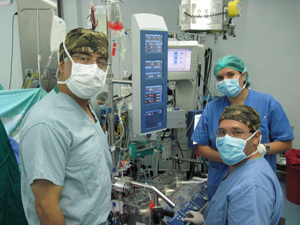 Since 1989, this cardiac team has regularly traveled to Ecuador and the team has worked exclusively at the Baca Ortiz Hospital for Children in Quito since 1998. The focus on this one hospital has produced excellent results. The professional exchange between the medical teams, sharing best practice ideas and skills building, has resulted in improved diagnostic and clinical skills for the hospital staff, increased donations of medical supplies and equipment and improved cardiac services for thousands of children. We are extremely grateful to our Team Leader, Dr. Tom Hougen, and our medical professionals with significant expertise in pediatric cardiology and cardiac surgery, who donate their time and talents toward improving cardiac care for vulnerable children in Ecuador.